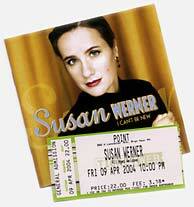 I haven’t seen Susan Werner in concert since her appearance at the Media Theater in 2002. She was touring with a band at the time to support her then-current CD "New Non Fiction." Although many of her CDs included collaborations with other musicians, I had never seen her share the stage with anyone. I remember thinking that the band diluted the impact Susan usually has live, and in the large theater, I missed the intimate rapport she creates with her audiences. Even though the Media show wasn’t my favorite, Susan had a new CD out, and I was eager to see her again. Last Friday, seven fellow Susan Werner fans and myself gathered together first for dinner at the Indian restaurant Khajuraho in Ardmore, and then descended on The Point in Bryn Mawr for Susan’s 10:00 PM show. First, a little bit about The Point. It is a reincarnation of and homage to the Main Point, a legendary venue that hosted such artists as Bruce Springsteen many, many years ago. I never saw Bruce there, but I am old enough to have attended a number of concerts there. The new Point is only a few doors down from the old (I didn’t even recognize the original location). It has much the same feeling as the original Main Point: a kind of coffeehouse atmosphere (although now you can order drinks!) with tables, chairs, and even comfortable couches randomly arranged around the room. The room is just large enough to hold a fair-sized audience, yet small enough that no one is sitting too far away. It’s probably the perfect place to hear music. Come to think of it, it’s probably the perfect place to play music, too. Susan Werner as sultry glamorpuss. Wish the photo were black and white, though. Susan’s new CD is called “I Can’t Be New” and represents a departure from her previous releases. Rather than being a showcase for her newest songwriting efforts, “I Can’t Be New” is a collection of songs she has written over the years that share a style and sensibility influenced by the great composers of American popular song, such as Cole Porter, Jerome Kern, or the Gershwins. It’s her “standards” album, only they are her own standards. All along Susan has been writing sophisticated music in her own style; these songs are merely in a more familiar genre. Susan appeared on Mountain Stage recently; I missed it, and could find no trace of an archive of the performance. She was interviewed on NPR and that interview is available along with several songs. Enjoy.